How does customer relationship management work in a world of a connected and transparent market of conversations? Social media, tablets, and the plethora of smart mobile phones have changed the way people are connected to one another and has opened the door to peer to peer conversations. Today people are more informed and connected and often the important decisions are influenced by social conversations. In this connected world, how do you as an organisation ensure that you stay connected, listen to what people think about your product and services and inevitably become part of the conversation through marketing, sales and customer service? 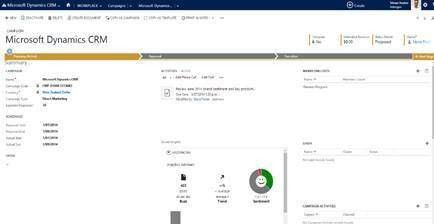 In the Microsoft Dynamics CRM Spring Release Microsoft launched Microsoft Social Listening, an enabler for you as an organisation to listen to conversations and reply in line, to stay connected with what your customers are talking about. So what does it look like, how easy is it to use? Well for starters if you utilise Office 365 and CRM online and have more than 10 Online Professional licences then you are entitled to it for free! Otherwise you can purchase the subscription via the Office 365 admin centre just like any other product. It has been designed to look and feel like Dynamics CRM and has been designed to be simple and intuitive so everyone who needs access can access with minimal user training. The screenshot to the side is of the homepage for Social listening and as you can see looks like Dynamics CRM 2013. 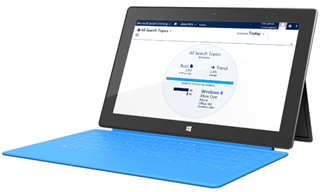 To set-up search terms to be monitored it is as simple as 1-2-3. 2. You define the search terms in terms of core keywords, inclusions that must be in the post to be included and exclusions to be excluded from the search results. 3. Finally you test the search criteria to get a sense for the average monthly posts to be consumed and activate the search and you are all done. Through the Microsoft Social Listening user interface you can drill into the results of the search, as standard MSL monitors YouTube, Twitter, Facebook Pages and non-private posts and over 70 million blogs. You can interact with the data and review trends, buzz, sentiment, authors and the reach of the authors. You can define alerts if certain keywords are mentioned or if the trend spikes. It becomes your early warning system and enables you to react quickly and efficiently to social interactions. 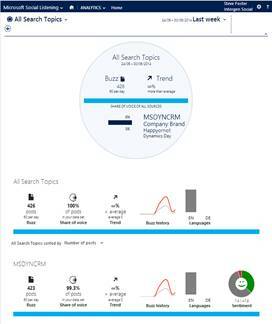 If you are using Dynamics CRM Online then you can also embed Social Listening into Dashboards and records. This is particularly useful for tracking campaigns, competitors and providing your sales and service teams a view of what people are taking about. So how could you get engaged, what scenarios should you focus on? 1. Empower Marketing – listen to the buzz that is being generated as a result of a campaign and use this insight to generate and cultivate new leads for the sales team. Listening is a low touch activity, but when you listen to the key messages then you can drive high touch conversations with peers in the buying stage of the ‘buyer’s journey’. 2. Empower the Sales team with insights – Enable via dashboards and pre-defined searches keyword searches that identify potential customers actively looking for product recommendations to solve a business problem. 3. Monitor your competition – Listen to what customers are saying about your brand can open the door to offering relevant solutions, but listening to what people are saying about your competitors can showcase weak spots in their offering. Think of it as an opportunity to help, and have the appropriate salesperson send the customer something useful. 1. What is the reason for measuring social conversations? 2. What are you trying to achieve and how it is aligned with your customer experience and other initiatives? 3. How will social add value beyond just the bottom line? 4. What metrics will you use to confirm if what you are doing is working? If you can answer these questions then you are on a good path to success. Intergen can help you with this journey and has tools and techniques to help you map out your social strategy and how this will affect your customer experience and journeys with your brand.